For those of you who have been wondering what it will take to help straw bale homes become more mainstream, this may be a part of the answer. David Arkin and Annie Tilt (Arkin-Tilt Architects) are well known for their beautiful and functional designs. 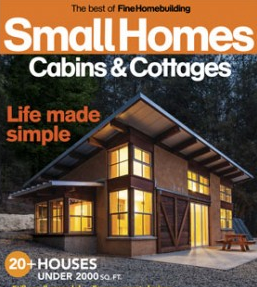 They have received many awards over the years and their straw bale homes have at least twice graced the covers of Fine Homebuilding Magazine, this time in the fall 2014 edition of Small Homes Cabins and Cottages. I have said for many years that we as a group of individuals, a community of straw bale fans, really need to focus on bringing straw bale construction into the light of everyday people. One way to do that is to start with inspiring design. As an example, when I would walk prospective clients through a home of mine, I would leave out the words “straw bale” and focus on the beauty, energy efficiency and overall design of the home. Once the prospective clients were drawn into those details, the words straw bale had much less scare factor to them. Let’s keep building on this exposure that Arkin-Tilt Architects, and others with a similar passion for straw bale construction are sharing with the world. Getting the word out to the masses will take time and effort. Every time a beautiful straw bale home is shared with the world, that steep mountain we seem to be climbing gets a little smaller. Keep it positive. Keep it beautiful. Agreed. We advise people that we we are design-agnostic…we can adapt the use of straw to most any architectural styling. So excellent design and quality efficiency minded construction – and in our case, precise costing – are what we promote first. When doing so, it just happens that strawbale walls routinely are able to meet those goals at a price consistent with conventional builders. The question then often becomes, “why not” use straw in such applications? Indeed, the natural building movement is being carried and developed on the backs of many individuals in the larger International Straw Bale Community and it is a great celebration when such great examples, such as David and Anne’s fine homebuilding article gets grocery line publicity. There are so many great resources and trade groups celebrating and supporting the industry such as California Straw Builders Assoc. (CASBA), Colorado Straw Bale Assoc (COSBA), AUSBALE, Ontario Natural Building coalition and many more creating, carrying and evolving the pulse of the industry. Bale On!! !